The Large Underground Xenon (LUX) experiment is placed in this former mine almost 1500 m underground in South Dakota, USA. 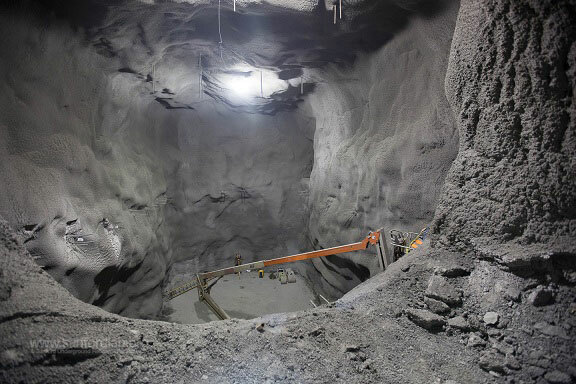 Credit: Matt Kapust, Sanford Underground Research Facility. Physicists are working on a new theory to detect dark matter. They believe that dark matter particles annihilate into “dark radiation” when they collide and that they should be able to detect the signals from this radiation. The majority of the mass in the Universe remains unknown. Despite knowing very little about this dark matter, its overall abundance is precisely measured. In other words: Physicists know it is out there, but they have not yet detected it. It is definitely worth looking for, argues Ian Shoemaker, former postdoctoral researcher at Center for Cosmology and Particle Physics Phenomenology (CP3), Department of Physics, Chemistry and Pharmacy, University of Southern Denmark, now at Penn State, USA. “There is no way of predicting what we can do with dark matter, if we detect it. But it might revolutionize our world. When scientists discovered quantum mechanics, it was considered a curiosity. Today quantum mechanics plays an important role in computers”, he says. Ever since dark matter was first theorized there have been many attempts to look for it, and now Ian Shoemaker and fellow scientists, Associate Professor Mads Toudal Frandsen, CP3, and John F. Cherry, postdoctoral researcher from Los Alamos National Laboratory, USA, suggest a new approach. They present their work in the journal Physical Review Letters. On Earth several detectors are placed in underground cavities, where disturbing noise is minimized. The hope is that one of these detectors will one day catch a dark matter particle passing through Earth. According to Ian Shoemaker, it is possible that this might happen, but given how little we know about dark matter we should keep an open mind and explore all paths that could lead to its detection. “If we add another way of looking for dark matter – the way, we suggest – then we will increase our chances of detecting dark matter in our underground cavities”, says Shoemaker. The researchers believe that when two dark matter particles meet, they will behave just like ordinary particles; that they will annihilate and create radiation in the process. In this case the radiation is called dark radiation, and it may be detected by the existing underground detectors. “Underground detection experiments may be able to detect the signals created by dark radiation”, Shoemaker says. The researchers have found that the Large Underground Xenon (LUX) experiment is in fact already sensitive to this signal and can with future data confirm or exclude their hypothesis for dark matter’s origin. The attempt to catch signals from dark radiation is not a new idea – it is currently being performed several places in space with satellite-based experiments. These places include the center of our galaxy, the Milky Way, and the Sun may also be such an area. None of the satellite-based experiments however have yet detected dark radiation. According to Shoemaker, Frandsen and Cherry, this could be because the experiments look for the wrong signals. 14 Comments on "Physicists Work on New Approach to Detect Dark Matter"
The mass of the Universe is .2025E54 kg. “Dark Matter” does not exist, it is a mistake of mistaken theory. The over=gravity rotation is the result of electromagnetic force, from electron flows into galaxies. galaxies are “Motors” made of the gravity rotation of charged suns. These rotating charged suns, create a magnetic B-field, perpendicular to the galactic plane. When electrons flow into the plane, the interaction of the electron flow and the B-field, create a force f=eVxB=VxP/r in the Rotation direction. The velocity v = (e/m)uI= 220I km/s where I is the current due to the moving suns. I is approximately 1 amp, for v=220 km/c. The velocity is proportional to the suns and their charge. The larger the current, the faster the sun moves. “charged suns”? Stars are pretty nearly electrically neutral. If stars tended to carry, say, a substantial positive charge, then our own sun would be no different. But electrically charged satellites are not repelled or attracted to the sun in any measurable way. The matter we live around is more or less electrically neutral. There are very nearly the same number of electrons as protons in any typical sample of matter, be it asteroid, moon dust, water, dirt, or Pluto. How can there be enough electrical and magnetic force generated by the thin differences in charge here and there, to account for a force four times as strong as gravity that’s holding the galaxy together? Because something is keeping galaxies from flying apart, which they would do if their spin were offset only by the mass of stars, dust, etc.—stuff we can see. What’s more, electrical charges don’t gravitationally lens light. Your idea does not account for the observational fact that galaxies bend light that goes past them to an extent that points to them having a mass about four times as much as the matter we can see would suggest. Here is info on sun charge. Here is info on electricity in space. Wardell, why would intelligent scientists not include electromagnetic forces into the equations used to model galaxies? Where is the scientific paper supporting this claim? Intelligent scientists might not be trained in electromagnetics. The galaxy is like a motor. The “black hole” is the the result of the rotating charges, creating a current I, this I crets a magnetic field B=uI/r. The B-field is the “Black hole”. The strength of the B-field can jet in the center due to field breakdown strength. The stronger the current the stronger the field, Black hole. Dark Matter may simply be the leftover plumes of cooling and spaghettified mass which was ejected by Quasars in the early universe. We know Quasars were once plentiful and DM seems to congregate around galaxies, so it seems a logical connection. Okay, but now I’m left with the question of what they think dark radiation is. If it’s not photons (thus not any electromagnetic radiation), then what other energy radiation is possible? The article mentions that maybe satellites are looking for the wrong signal (photons of various wavelengths), so exactly What would be the “right” signal? Dark photons would be something that carries energy and momentum at the speed of light from one bit of dark matter to another. You’d have to hypothesize “dark charge”, that is, that dark matter interacts with itself by way of forces just like our own familiar electrostatic force, but that those forces only apply to dark matter. This would be just about impossible to observe directly, but it could have consequences that would affect the distribution of dark matter in our galaxy and others, and if we could learn enough about that distribution, we could at some point find ourselves in a position to say that hypothetical dark matter whose physics was that only gravity acted on it, would be distributed in a way inconsistent with our own indirectly computed distribution of dark matter in galaxies. And more nearly consistent with thus and so a model of how dark matter exchanges “dark radiation”. Dark matter is ordinary matter existing in alternate universes (alternate “realities”), affecting our universe via gravitational effects. Therefore it is undetectable as different from the matter we interact with in “our” reality, by any scientific means. Alternate universes or timelines are generated and removed by recombination constantly; the total matter in all timelines is about 5.5 times the matter we call “ordinary”; it is a universal constant. It has no matter-antimatter annihilation properties, no magical uses to discover. “Physicists know it is out there,” Please, it’s out from where? Does anyone understand what observation was done to come to the conclusion that dark matter must exist? The theory of special relativity was shown to be incorrect, so to make things right they added dark matter(more gravity) to explain the observations. Relativity did not predict expanding space and it did not predict the fast orbiting stars along the outer edge of galaxies. It did not predict the radiation(light) emanating from black holes and it did not predict the solar wind coming from a black hole. Let’s face it, Relativity is wrong if it could not predict any of these things. Relativity only describes the reaction of gravity not the action causing gravity, so the theory is only half right. If Relativity had addressed the cause of gravity then it would have easily predicted everything, even expanding space and why the stars in a galaxy move rapidly furthest from it’s black hole. Relativity would also have predicted how galaxies formed. It would have predicted the age of the stars based on their distance from the black hole or source from which they came. Relativity would have also predicted the young age of Pluto, and would have predicted the Kuiper belt objects to be the youngest objects in our solar system. No one has yet to address why dark matter is distributed gradually throughout a galaxy. Why where there is less mass, there is more of a dark matter effect, yet where mass is concentrated like near a black hole the effect of dark matter is sparse? See the black hole, Sgr A* gravitational effect on the G2 gas cloud. BTW, if the Kuiper belt objects are found to be the youngest in the solar system then it will be empirical evidence showing the Nebular Theory to be wrong, an assumption. Thus the theory on how galaxies formed and the big bang would also be wrong, based on assumptions. Forget what you were told, assumptions like the nebular theory and start over by using all the observational data. Eventually everything, if you are intelligent, should fall into place, even the action causing gravity. Weren’t “scientists” ten years ago digging out caverns looking for neutrino waves or something like that? Why can’t they use the same bloody holes just with more detection equipment? Or do one of these parties not wash their feet, hair, or asses well enough for the other party?